"…I'm almost at the 1000 mile mark and haven't had any problems yet. IMO its a great bike for the price." The new Windsor Bristol 3.0 is just the road bike for the rider wanting the performance and lightweight of an aluminum frame, coupled with the comfort and reliable performance of a CRMo fork and dealing with a budget. Plus, powerful disc brakes give confidence in a wider range of conditions than regular rim brakes. 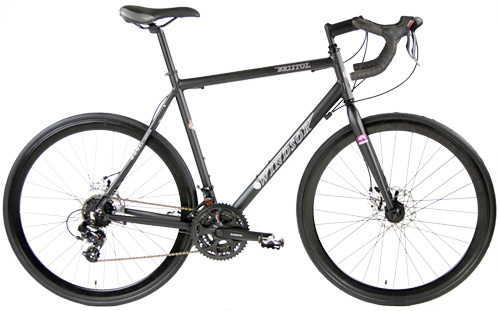 Compare this bike to the Trek or Giant Disc Brake equipped Road bikes at $1000 to $1199 plus tax. Both bikes may have the same number of gears - 21 speed Shimano parts and aluminum frames. Trek Road Bikes with similar specs maybe up to $300 more. Be aware, other brands will use non-Shimano parts on the drivetrain. Why do you think they do that? A full Shimano drivetrain is designed to work together for optimum performance and smoothest shifting and reliability.